In her luminous poems, Ellen Grace O’Brian manages to braid contemporary moments of everyday life with ancient spiritual teachings—the sight of a hummingbird’s red throat, bread on the table, a couple’s quarrel, a mother’s advice—become doorways into the divine mystical heart. The Moon Reminded Me, subtly laced with Sanskrit, gives us an insight into a poet who bridges two worlds eloquently enough to take us along with her. Sandhya, the numinous time for stepping into the temple, suddenly becomes this moment, now. In The Moon Reminded Me, Yogacharya Ellen Grace O’Brian presents a rare combination of deep yogic vision and intricate poetic skill, awakening us to our inner journey of Self-realization. 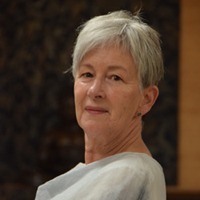 Yogacharya Ellen Grace O’Brian is a spiritual teacher, poet, writer, and spiritual director of Center for Spiritual Enlightenment—a Kriya Yoga Meditation Center in San Jose, California. 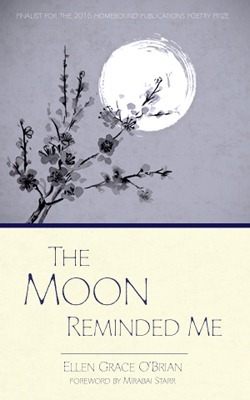 Her published works include Living the Eternal Way: Spiritual Meaning and Practice in Daily Life; Living for the Sake of the Soul; and three volumes of poetry including the award-winning 2017 release: The Moon Reminded Me. She is editor of Enlightenment Journal and host of The Yoga Hour, a weekly podcast.